If you're trying to reduce your total cholesterol, it's important to include foods that are high in fiber while avoiding saturated fat. We've pulled together a few of our favorite recipes that fit the bill. With 9 grams of fiber and less than 2 grams of saturated fat, these stuffed peppers are full of good-for-you things. They also happen to be gluten-free and vegan, in case you're cooking for a crowd. You don't have to avoid the foods you love while trying to eat heart healthy, check out this whole grain variation on waffles. Adding fresh raspberries or blueberries will add even more beneficial fiber. Replacing white rice with brown rice or cauliflower rice is a great way to sneak in more fiber. Try it with this easy-to-meal-prep dish. This dish is all about simplicity and taste. 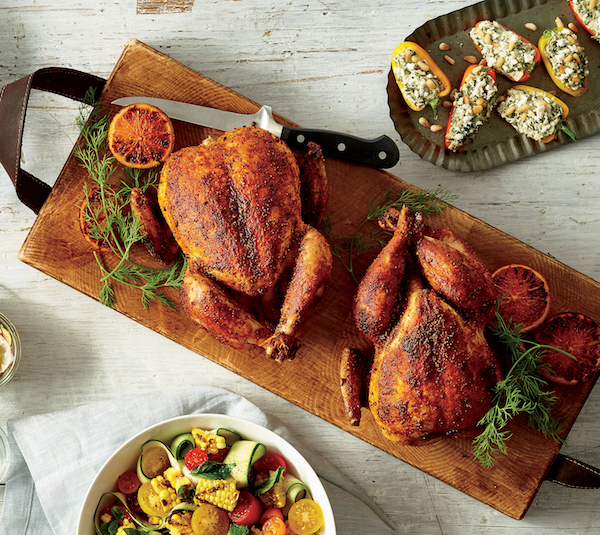 We love that it comes together on one sheet pan while having layers of lemon and herb flavors. If you're trying to incorporate more seafood into your heart-healthy plan, this one's a must. In search of the perfect healthy muffin that doesn't taste like cardboard? We've finally found it. Each one packs in 4 grams of fiber and contains barely any saturated fat. Beans are known for being high in fiber, so it's no surprise these tasty bean burgers pack in 10 grams. The trick to making them taste amazing is to add a few tablespoons of garlicky hummus. It's a 5-ingredient recipe, but we're not gonna stop anyone from adding extra veggies. Including different kinds of grains (like wheat berries and sorghum) in salads is a great way to create a balanced dish full of the nutrients you need. Try swapping out half your morning oats for a different grain instead. We like this quinoa-oat combo for added protein and nutrients, like heart-healthy fiber. Farro is another underappreciated grain with a nice chewy texture and nutty flavor—plus, it's a good way to get more fiber on the plate. We eat salmon because it's delicious. But one of the added benefits is that omega-3 fats found in salmon may help reduce triglycerides. Just one of the reasons it's considered heart-healthy. If you're a meal prepper, you'll love these individual and freezable portions of baked oatmeal. Each one contains 3 grams of fiber. Pair one with a cup of raspberries to bump the fiber up by 8 or 9 grams. For entertaining or weeknight dinners, we love this healthier version of chili (each serving contains 12 grams of fiber! ), especially with a dollop of guac or sliced avocado on top. We love everything about veggie noodles. For this recipe, you can use an assortment of different veggies, or just stick with your favorite. This dish is an excellent source of calcium and vitamins A and C, not to mention all the fiber, healthy fats, and protein. This might be our new favorite heart-healthy meal. No, it definitely is.